You are here: Home / News / Latest / Successful testing @Oikos site! At the beginning of last year, Geldof was entrusted with a project 50 km east of Londen. Our scope consists of the construction and painting works of 12 storage tanks, each one of them with a volume of ca. 7000m³. 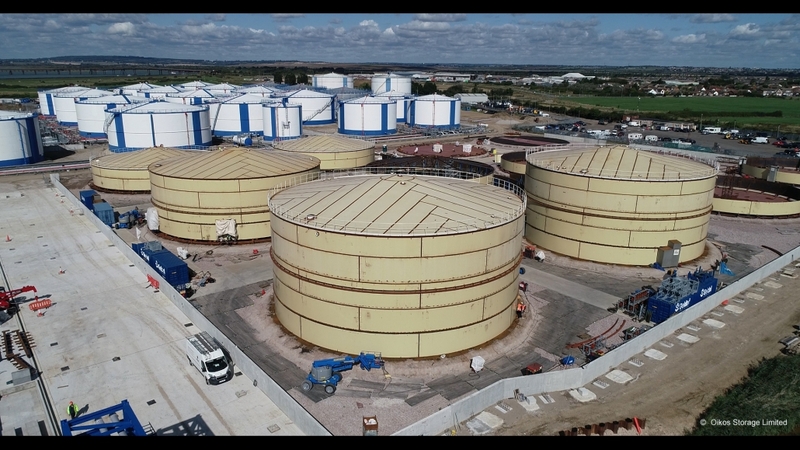 Some preparations have been done in our workshop at Harelbeke, but the erection of the storage tanks itself happens on site in Canvey Island, whereby the remarkable ‘Jacking Method’ is used to limit works in height. This means we start, as usual, with the bottom, but instead of continuing with the lowest shell ring, we first place supporting ‘chairs’ on the bottom, followed by the 4th and 5th shell rings (being the upper ones) and the roof. Once those are finished, they are lifted as one using our ‘jacks’ to ‘underfill’ with the 3rd shell ring. The same process is then repeated for the 2nd and 1st ring. https://geldof.be/wp-content/uploads/2019/01/190118_Geldof_Oikos2-copy.jpg 1080 1920 Sophie Verhaeghe https://www.geldof.be/wp-content/uploads/2018/10/Geldof_Logos_Loop.gif Sophie Verhaeghe2019-01-18 11:47:272019-01-23 14:49:14Successful testing @Oikos site!